I wanted to let all you wonderful customers know that I am currently in Anaheim at CHA. I will be shipping all orders upon my return home on Thursday, February 1st. I thank you for your patience and look forward to sharing pictures at that time. Being that I do not have my own laptop (yes, I am in the dark ages - LOL) I haven't been able to update this information until now. Prepping to get here was an absolute mad scramble, but I'm thrilled to be here and taking note of the awesome new products as well as learning new ways of using the "old". OK, old can mean six months or a year - LOL. Funny how that can be considered old. I LOVE the new We R Memory Keepers hardware kits!!!! OH WOW!!! They have the most amazing product included and for a VERY reasonable price. 300 pieces for less than $20. Colors silver, pewter, brass and copper!!!! YUM, YUM, YUM. I have discovered some of the most amazing papers! 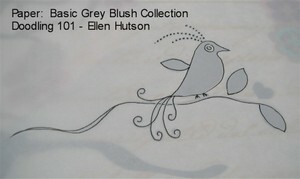 Canvas, galvanized, fabulous patterns!!! OK - typing on Mona Lisa's laptop is a new experience and so I'm not being very wordy - LOL! Chipboard - every shape, size, color, texture imaginable. MANY different purses, books, journals, recipe boxes - if you can imagine it, I do believe they have it! The most amazing craftmanship I have seen is in the Accucut booth. I can hardly wait to share the photos of the dress they created out of diecuts!!! WOW, WOW, WOW - it is covered in little layers of flowers, that sparkle and shimmer. The workmanship on this item is outstanding!!! Last but not least - I met Tim Holtz :D What a cutie - his new line of alterable tins produced by Crop In Style to house the Distress Inks is way cute. At the booth they are doing a make 'n take with these awesome little metal tins (that are not yet for sale -insert sad eyes). Hopefully I'll have the time to make one so that I can share it with you all. If nothing else I will share some pics. Hopefully I'll be able to check back in at some point before returning and share more of the little tidbits I have discovered that I am excited about. Thanks so much your patience in regards to shipping your packages. They will be shipped as soon as I return. THANK YOU!!! First some good news for you Cuttlebug fans who are wanting to use your bug with Texture plates, brass stencils, etc. - the Wizard Charm Embossing Kits are back in the store :D For more information on using the Cuttlebug with these plates check out previous posts here. Secondly, I've been tagged, but I just haven't had the time to play. I promise when I return from CHA I'll get to it! I have been creating like a mad woman! If you know me at all you know that I don't like leaving things until the last minute and so this is SO not like me - LOL! Life has taken a whole new twist it seems with all the deadlines being thrown my way, but I keep hopping over those hurdles as they come. Now on to my first creation. 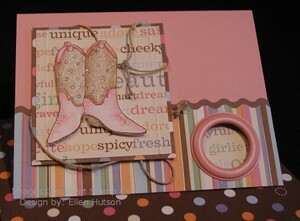 Scrapbooking - this cutter is a TRUE treat when it comes to creating scrapbook pages!!! All I can say is WOW! 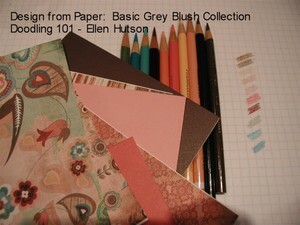 Unfortunately I do not have a lot of experience with this form of papercrafting, but I do find it fascinating!!! 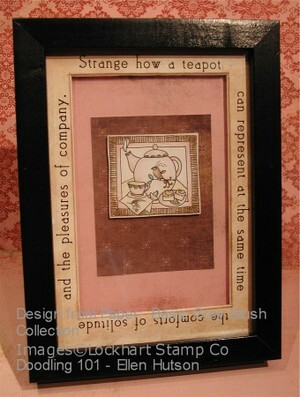 In creating the pages for the Create-a-cut booth at CHA I began with a theme. The theme I selected was "Color Your World with Create-a-Cut". The first page I am going to share with you tonight is my "Red" page. My first step was selecting the picture. What could be more perfect for red than a Christmas picture? This is a picture I have shared before here on my blog - it is one that I truly LOVE! The expressions on the faces of my girls, as well as the one on Santa's face, are what make this a picture I treasure - perfect for scrapbooking, so that it can always be cherished. 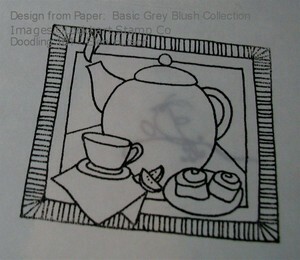 The photo I selected needed to go in the upper right corner of the page due to the way the picture is composed. Doing a quick sketch to lay out my design helped me get a feel for the proportion. Then I started to play with the cutter. I LOVE the way I was able to create a scalloped edge on this patterened paper, then on the solids to match them up and finally on the photo itself!!! 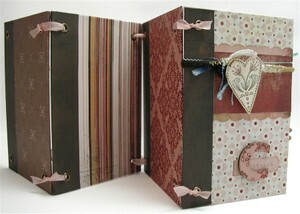 It is what I am trying to spotlight with this page - the versatility of creating marvelous edges to ANY paper! I love Bazzill paper, but you certainly will have a much more difficult time getting your photos cut with that same edge detail. I hope that you find this little edge detail intriguing. Note how the corners match perfectly. This cutter makes it a breeze to "calculate" where your scallop will start and stop on a piece of paper! It is the thing I appreciate the most about the cutter. Just a little "bling" to make it sparkle and I have my first scrapbook page. Can I consider myself a scrapbooker now? LOL! Create-a-cut scallop blade; Memory Box 12x12 Flirt Paper, Burgundy and Cranberry; Making Memories Trim, Brad, Stickers, Tag Maker, Stick Pins; A Muse Twinkle Stickers; A Stamp in the Hand Script Background; Ranger Raisin Ink Pad. Hopefully I will be able to share the other six pages over the next week or so to share with you the other wonderful things I discovered about this cutter during my creating sessions. 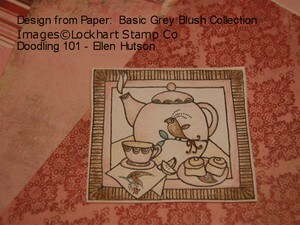 I leave for CHA on Saturday and I still have BOATLOADS to do, so off I go and create some more!!! Please stop by and see me and do my little make 'n take at booth #1833 between 10:30 and 1:30 if you are at the show!!! At long last I sat down yesterday and put together the project for my next class. Too much to do - to little time!!! LOL! 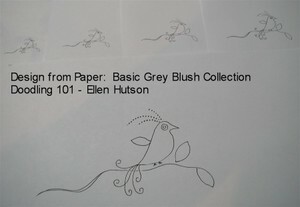 The idea for this entire accordion came from my desire to use the Basic Grey Blush paper (all of it Ü - unfortunately, I couldn't quite achieve that goal without having it UBBER busy - LOL! ), together with the Lockheart Folk Heart. The little heart above is the Lockhart Lock Heart Ü Get it Lockhart LockHart - oh man - I had better get to bed early tonight - LOL!) 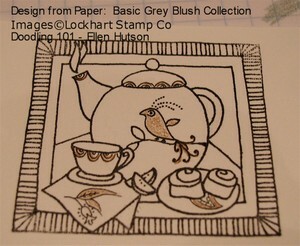 What I love about this little stamp is that it is turning out to be an ideal stamp to try so many different techniques with. 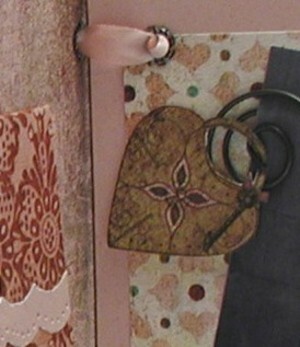 The little locket above is stamped on the patterned paper, cut out and then selectively colored. 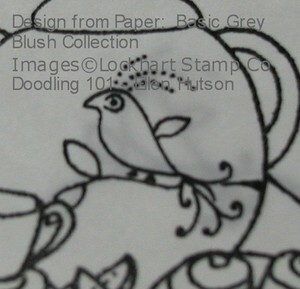 I hope to find time to showcase this wonderful little stamp in other ways before the big "V" day is upon us. So now it's just compiling the list of materials, ordering them, photographing everything yet again and then it will be ready to put in the store. Please expect it some time mid-summer - just kidding - LOL! BUT this next week is over the top and then it's CHA so I do know that realistically it won't be until sometime in February that this kit is ready. Thanks for your patience and I hope to start getting a little ahead of the game with my class kits, rather than WAY behind as I currently am! Have a wonderful weekend and I hope you enjoy this sneak peak. Just a quick update on the status of the stencils - unfortunately the piercing stencils will not be arriving back in the store until February 1st. Just a little warning - I will be out of town attending CHA from January 27th through the 31st and will not be able to fill orders during that time. Hopefully the wait will be worth it though, being that I will have found all kinds of amazing new toys (I mean tools - LOL) to share with you all. I also want to add a shout out for my amazingly talented friend Mona Lisa (Lisa Strahl). If you are not yet a member of the Splitcoaststampers Fan Club now is definitely the time to join. Sweet Ms. Mona Lisa is one of the latest additions to this VERY talented group!!! Check out Mona Lisa and the other amazingly talented women's projects by signing up for the fan club ASAP. It is the best $$$ you will have spent in a long time! I just received the most amazing news!!! Look here!!! That's my card - LOL! I had no idea that they were going to use it in this way - what an awesome surprise. In fact I actually wondered if it had been lost or thrown away being that I hadn't heard anything further regarding this card. I'm such a novice - LOL! I will have another card in this issue as well that features the Lockhart bride. Unfortunately I can't share it here, but I'm really excited about how it turned out! 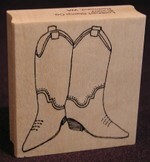 are once again temporarily sold out! Please note that I have pulled them from my website until I learn what day my order arrives here. Thank you all again for your amazing support!!! We have contacted Visa as well and unfortunately they will not give us any type of approval until we receive word from Nikon, but they are stating a $1000 limit. This won't cover it, but I have my fingers, toes, legs - all are crossed in hopes that they will contribute to helping recover my camera. So to make a LONG story shorter - it looks like we are going to be waiting, and waiting, and waiting... I'm trying to just focus on getting things done and not think about it. Thanks for your care and concern - it means the world to me and I will be certain to let you know what will happen when I know. I truly hope and pray that this has saved other's from toppling their camera's. Always remember to make certain that the lens is OVER A LEG, and don't just walk away from it even if you believe it is stable. I don't know about you, but I love a good story about how a product came about. I thought I would share this with you because I found it so interesting! The teflon bone folder is made by a family owned business. The inventor of this fabulous tool is a gentleman who has been a chemical engineer with over 30 years of experience. Part of his experience stems from the Ukraine, as that is where his family immigrated from over 18 years ago. When I met Yan over the phone I felt an instant bond with him - it was his accent. It is the exact same accent of my uncle. I too am from parents who immigrated to Canada (mine immigrated 82 and 74 years ago - they met and married in Canada). It turns out that both of my parents were born in almost the exact same location of the world as Yan. It is indeed a small world! But back to Yan's story. He started this business about 7 years ago as a coating business and accidentally expanded into the bookbinding/conservation tool industry, and NOW the papercrafting world Ü. In meeting with a local bookbinder who needed assistance with her tools the discovery was made. This bookbinder was also in a family business, passed down through her father over 40 years ago. They met with her in her bookbinding shop. Here she had all kinds of projects she was working on, such as old family bibles that needed restoration to books she was putting together for local schools. Yan was very interested in her business, being it was something he had no experience in, but respected highly being that it required much patience and expertise. She shared a lot about the business and happened to show them her bone folder that was actually made from metal! When they saw how she applied this bone folder they noticed that she had to be extra careful in sliding it because the metal being so dense, and the corners being rough left burnishing marks, as well as it was hard on the papers. Yan's brain started "ticking", he's a very innovative man. So the story goes that it was indeed an accident that the discovery was made that there was a need for this tool, but if it wasn't for the vision that Yan had, this tool may not have never been invented. 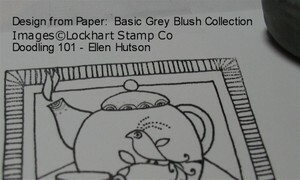 By the way, it is safe to say that when the bookbinder tested out the new product, she LOVED it! Customers now range across the United States and as far as England, New Zealand and further. The family is very proud of their tools and love being part of such a talented and creative industry. The bone folders are made from Teflon unlike traditional bone material (or metal as in the first case). This composition gives the folder non-stick qualities, thus when you use your bone folder with glue it will NOT stick (such as for making boxes, bookbinding or now papercrafting!) or if you run it down the paper as you score your card you will not "shine" your paper as with the typical bone folder. They are also chemically inert, non-corrosive and non-contaminating. This makes it an ideal tool for conservators. So if you want acid-free, this is truly acid-free. Recently at a conference in New York City, the 100th Anniversary of the Bookbinder's Guild, there were many individuals there that are current customers and everyone raved about the Teflon Bone Folder's. Testimonials are that "Once you touch one of these, you really can't put it down." Well I kid you not - I feel the exact same way! I will never go back to using my old bone folder again and that is why I had to find this resource to share with all of you. I hope you enjoyed this story as much as I did when it was shared with me. Thanks for stopping by today and have a wonderful weekend! I know I promised a lesson on doodling and I apologize right now that it still hasn't hit the net, but yikes is life busy!!! With all the publication work, CHA prep, sustaining everyday business and life of two girls and a hubby... 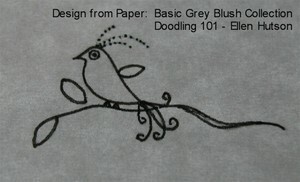 I truly apologize for not getting to my, "How to Learn to Doodle with Ease" lesson. 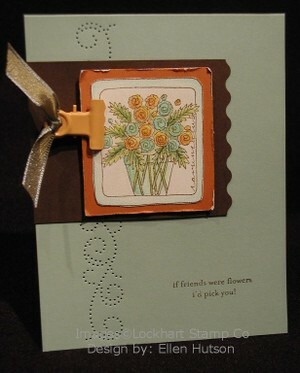 In it's place I'll just share one of the cards I made at our Virtual stamping party on Saturday night. I am so glad I at least have something to share - LOL! This challenge was once again color based - Caribbean, Pumpkin and Chocolate were the colors of choice. So I pulled out my brand new Lockhart Ranunculas stamp and allowed myself the luxury of relaxing and coloring. It seems like a lifetime ago - LOL! Being that I wanted the image to speak for itself I dressed it up with just a little Stardust, some paper piercing using my fave border stencil, trimmed a piece of cardstock with the small wavy blade, added a Making Memories Cheeky clip embellished with May Arts ribbon, stamped my A Muse sentiment and voila - complete. 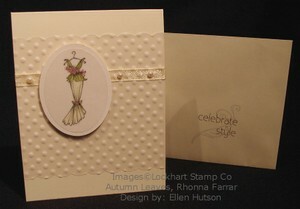 A simple pierced card that took very little time to make. I quickly want to let everyone know that I am currently out of supply on the Create-a-cut, but more have been ordered and should be arriving tomorrow or the next day. All orders placed yesterday and today will be the first to go out. I thank you so much for your support and patience and will update again when they arrive. ETA: Good news - the cutters arrived late Friday. I am packaging up all orders today to ship out tomorrow Ü If you would like a cutter you can place your order now and it should ship out promptly. First off I would like to thank you all so much for your heartfelt responses!!! I have my fingers crossed, my toes crossed, my legs crossed - LOL - you get the picture! I am hopeful that our Credit Card company will be able to help replace my camera. I will be certain to let you all know what happens. BUT please, please, please remember to always be certain that you understand your "gear" so that you don't end up in a similar situation to mine! Yesterday evening my niece and I went on a creating spree together - well we thought it was going to be a spree, but being that we both like things extremely well done our spree turned in to only one "very well designed" (said tongue in cheek, with a whole lot of laughter) card. Just a little background on my niece - she has studied graphic design focusing on the digital aspect of design and so between the two of us we have quite the design background - LOL! We are both what you might term perfectionists as well, so you can see where this story is leading. 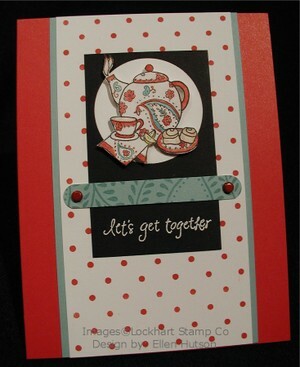 The card we designed is replicated below. The one we made last night is actually a wedding card and so the main image was the A Muse bride and groom, but being that I have my brand new untouched Lockhart stamps I just had to play with one of those today instead, when I remade our card from last night. This card we made only took HOURS to finalize on the details because we kept coming up with "better" ideas as we went - tee hee! I will not go on any more but just share the picture of the final product and then do a little explaining. So what do you think? was it worth the hours of love we put into it? (insert big grin). It started with the piece of vellum I had created weeks ago when I was playing with my Cuttlebug. 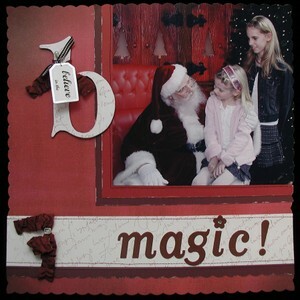 I had ran it through the Cuttlebug using the Fiskars texture plate and Wizard Charm Kit. I LOVE how vellum looks embossed and have since ran my CB folders through with vellum inside, brass templates, etc. We wanted the card to be simply elegant and it had to start someplace, so this was it. The bride's dress is a soft white and so I started gathering things to make a soft monochromatic card. 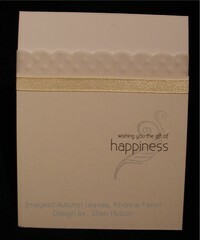 We used the Memory Box eggshell notecard and envelope; Iridescents, Cryogen White CS, and Worldwin 48# Vellum. I then started pulling out the embellishments that I thought would lend themselves to this feeling of understated elegance - thus the Making Memories Pearls and May Arts ribbon. We worked using the rule of thirds to establish the face of this card. If you dissect the card front and place your focal point where the vertical and horizontal thirds meet it will be an interesting diversion from the perfectly centered image that balances an image symmetrically.